One thing the world of social media has taught us is just how closely we are all connected. You'll find friends, relatives and business contacts who are in many of the same circles as you. Yet all the high-tech ways of staying in touch can leave an impersonal impression. Thank goodness we can still send actual letters when it really matters! These bright yellow return address labels give you a cheerful way to top off every piece of mail. And since they are self-adhesive, they also make your life a little easier. Just peel and place them on every envelope and forget about scribbling out your name and address by hand. 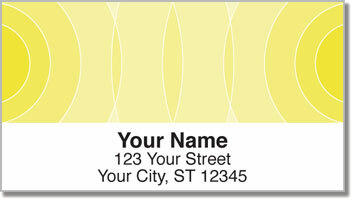 Order your own Yellow Networker Address Labels now. You can also get matching personal checks!